I guess my thought is ppl keeping jawing about lighting a fire under Joey. Well, they should just not annoint him the QB come training camp and make it known as an open position even around the league so that we can get bites from some of the better options. First you will see how Joey reacts...mature or baby...then if he reacts well let em rip. Best man gets the job. If Joey has another year like last he has to be done here. No more excuses and all must reasonably agree to that. It's not that he is old cause he is the same age that Batch was when Batch started from what I remember...McMahon is still young as well...younger than Joey in fact. I didn't realize Holcomb was 30+ though but he should fetch a good low price. Garcia has had one bad year, not sure he is washed up with. The Browns didn't have a ton on offense, plus they scored about 50 points in a game and still lost. Warner hasn't shown anything in a few years. I'm leaving out Brees and Hasselbeck at this point. The best available QB is John Kitna and he's not actually avilable you have to give up what I'm guessing would be 1st round pick to get him. But remember Kitna was chased out Seattle for not being able to run Holgrem's WCO. Rest the guys are backup material at this point in their careers. I think right now Mooch is looking for an escape goat for is listless WCO. All I know it's looked horrible here in Detroit no matter who's been the QB Batch, Detmer, McMahon or Harrington. The only offensive player who pulled his own weight this year was Kevin Jones. And that was only have half the season and for the most part first half of games. Wow Leo, I am really digging your posts. I too like Kitna. He was on my fantasy team last year. I think he has the confidence and skills to make it, but he will not like it hear if he can't start. Millen/Mooch have to make the starting job open to comp. Joey has said that he doensn't feel like he is playing for his job. He needs more fire, and maybe training camp competition will be what gives him that. How would we get Kitna, anyway? Who would we lose? Anybody? I don't know about the 1st round pick for Kitna...in that I don't think Cincy would ask for one, and he definately isn't worth it. I don't think anyone can disagree that Detroit's offense has been less than energenic, seeming to refuse to go into the no-huddle. Holcomb is O.K. and nothing more. Keep in mind the type of offense he ran, it wasn't the W.C.O. Warner.........nothing needs to be said. Garcia... He plays well in or out of the pocket. I don't see him going to Detroit as he wants to be a starter. Does he ever seem to actually get it done though? Besides, he'll cost too much. Of the quarterbacks listed by Pablo, Kitna is probably the best "back-up" prospect. A little bit back to the Killer stuff. I'm enjoying seeing his balls in a vise. Haha. It's so much fun. This guy is the most unprofessional wannabe journalist I've ever seen. I admit I like being privy to some of his insights that no typical fan gets. But that's just what he is, a fan pretending to be a journalist or reporter or whatever. He just runs his mouth like your annoying know it all fan. Haha. Too Fun. Garcia... He plays well in or out of the pocket. I don't see him going to Detroit as he wants to be a starter. He wants to be a starter and Mooch is NOT married or in love with Joey...seems like Mooch would make a call and tell Garcia that he would have a very good chance to start. Depending on money but with the rumors of yesterday this would make sense. Nobody available would push Joey more than Garcia due to his history. HBlue...I admit that Killer is awful ofy and not a Pulitzer Prize journalist but I read him and the others for the information they have access and not about their style. That's why I am not big into Mitch cause he is a great writer but I rarely find tells me anything I don't know. I have to believe that this story is true and that he is right. He was getting his bawls busted big on 1270 (affiliated with the Lions) but elsewhere he wasn't being judged like that people were more talking about the story. I dont think that Mooch can find a person to fit his style. Garcia is probley the only guy who could make it happen. 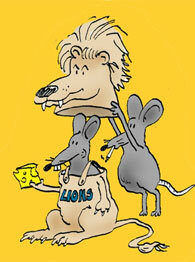 as long as I can rember the Lions have always had QB contrevirse. I could only dream what it would be like to wake up and think the Lions have a true starting QB who can get it done week in and week out.